Two recent graduates of the supply chain management Ph.D. program at the Sam M. Walton College of Business at the University of Arkansas received awards at the annual meeting of the Academy of Management. The meeting was held in Chicago in August. 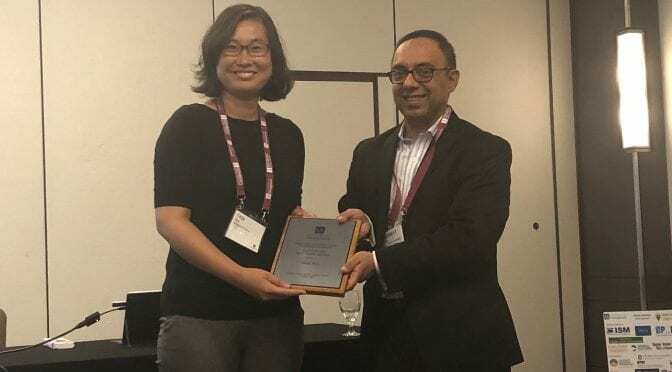 Siqi Ma, who earned a Walton College Ph.D. in 2017, received the Chan Hahn Best Paper Award, selected from all papers submitted to Operations and Supply Chain Management division of the conference. Her paper, based on an essay from her doctoral dissertation, “Gender Pairing and Cooperative Behavior: An Experimental Study” is co-authored with Li Hao, affiliated faculty in the Walton College Department of Economics, and John Aloysius, professor and Oren Harris Chair in Logistics in the Department of Supply Chain Management. Her research was funded by a summer research grant from Walton College’s Office of Diversity and Inclusion. There are important implications from the findings as they provide an economic rationale for diversity programs for supply chain managers, beyond the social reasons that usually underlie such initiatives. Saif Mir, who also earned a Ph.D. from Walton College in 2017, received the best paper award for an article published in the Journal of Supply Chain Management. The paper – “Understanding Supplier Switching Behavior: The Role of Psychological Contracts in a Competitive Setting” – is co-authored with Aloysius and Stephanie Eckerd of Indiana University. Two Walton College supply chain management Ph.D. students presented their research at the meeting. Marat Davletshin presented his paper “The Influence of Supply Network Fragility on Firm Equity Risk,” co-authored with Vidit Agrawal of the University of Arkansas Department of Physics and Brian Fugate, chair of the Walton College supply chain management department. Yanji Duan presented her paper “Nudging People to Pay More for Products from Pro-Environmental Firms,” co-authored with Aloysius. Operations and Supply Chain Management, which is one of the original divisions of the academy, focuses on the management of the processes that create and deliver products or services. Operations and Supply Chain scholars have the opportunity to interact with top scholars from many adjacent divisions and special interest groups, including Organizational Behavior, Organizations and the Natural Environment, Business Policy and Strategy, and Technology and Innovation Management. The annual meeting of the academy is a leading forum for empirical research on supply chain management.